SF Flotation Plant is widely used for roughing, concentrating and counter-flotation of nonferrous metal that includes gold, copper, lead, zinc, nickel and molybdenum, ferrous metal and nonmetallic mineral. The impeller is driven by V-belts, which can bring the centrifugal effect to form the negative pressure. On the one hand, to inhale sufficient air to mix with ore pulp; on the other hand, to stir ore pulp and mix with medication to form the mineralized froth. To adjust the height of the flashboard to control the liquid level and make the useful froth scraped by the loam board. Long service life flotation separation. Our engineer guide installation, connection and teach operation, also design according to your mine information like gold flotation, zinc flotation, copper flotation. The flotation plant is always applied with SF series flotation machines to form a joint unit; SF flotation machine is used for inhalation slot of pulp self-absorption while JJF series flotation machine is used for DC slot. And then, operation space is level configuration without foam pump to get high sorting indicators. JJF series and SF series also play their respective advantages. It is mainly used for copper, lead, zinc, nickel, molybdenum, gold and other non-ferrous metals, ferrous metals and non-metallic minerals roughing, selection and flotation operations. JXSC has a professional installation team, they are hardworking, industriously studying and brave in innovating. So far, they have successfully finished installation and commissioning tasks for thousands of large and small projects. Besides, the JXSC installation team also helps our customers train the operations staff until they can operate the machinery independently. The luxurious commercial vehicles service you during the whole journey, completely solving the travel problems after you come to Ganzhou; an elegant cafe keeps you comfortable when negotiating with us. Original spare parts are the heart of crushing and screening plant. JXSC supplies quality original parts to protect your investment and our experienced product specialists can ensure you receive exactly what you need to get your equipment back on working ASAP. 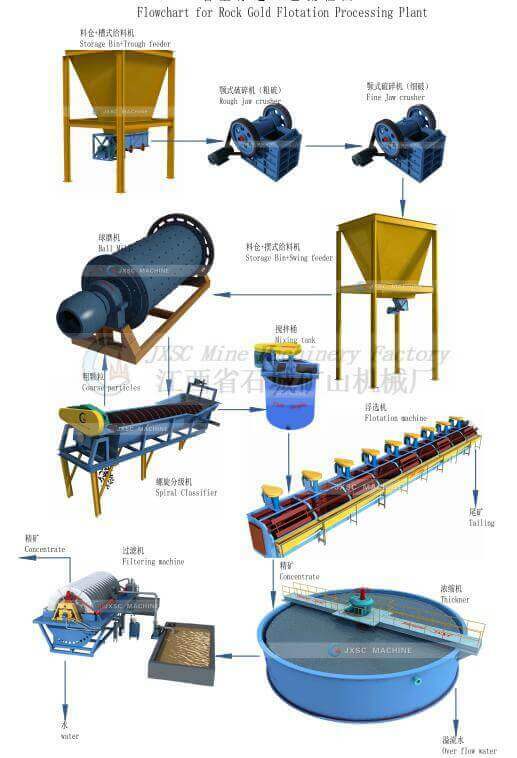 Our professional engineers design the total line of gold ore beneficiation flow diagram. Below is a general flotation flow for reference. We will design the complete ore flotation plant according to your mine info and your working site area. Welcome you visiting our working site to see the machines in working condition. Jiangxi Shicheng Mine Machinery Factory is a leading China mineral separator machinery manufacturer and supplier, as a professional mineral separator machinery company, we have a well-run mineral separator machinery factory. Thank you for taking the time to go through our High-Efficiency Gold Mining Flotation plant. We provide a complete floatation separation production line service. If you have any questions, comments, or anything we can do for you, please do not hesitate to contact us at any time.